10tons has announced that the twin-stick shooter Tesla vs Lovecraft will release for Nintendo Switch via the Nintendo eShop on March 16, 2018 for $14.99. 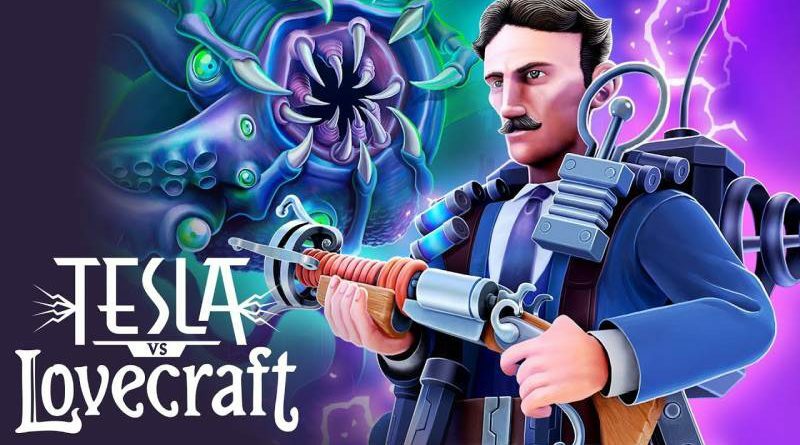 Tesla vs Lovecraft is a twin stick top-down shooter. The game sees the player, as the inventor Nikola Tesla, take on the minion hordes of horror author H.P. Lovecraft. A Quantum Teleport backpack allows the player to warp a short distance even through walls and monsters, whereas the Tesla-Mech battle robot grants the player an immense but temporary boost in firepower. A hefty arsenal of conventional and scifi weapons, powerups, special abilities, and selectable perks is also present. Use the Quantum Teleport to zip out of harm’s way and travel through solid objects! Activate the Tesla-Mech battle robot to rip apart even the most hideous abominations! Attack with shotguns, energy weapons, and scientific marvels such as the X-Ray Blade! Fight through story mode with bossfights and compete in survival mode online leaderboards! Blast monsters together in local co-op for 2-4 players!